Check out the Financial Plan for budget information and a complete list of the City's Capital Improvement Program. Click through the list below for details on active engineering and parks construction projects and planning projects. The Engineering, Parks & Environment department has introduced a new and exciting tool. Click on the links below to view maps which provide a visual of all 2018 projects throughout the community. For more information on ongoing construction projects in the City, please contact the City Engineering, Parks and Environment department at 604-514-2997 or email engineering@langleycity.ca. 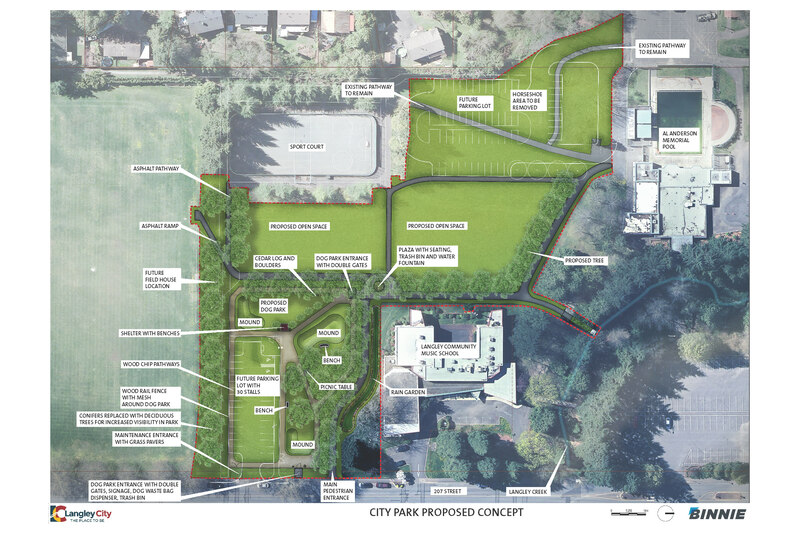 The City is implementing a section of the City Park Master Plan. The contractor has started the project and it is expected to be completed by the end of May 2019. For more information on planning projects in the City, please contact the City Engineering, Parks and Environment department at 604-514-2997 or email engineering@langleycity.ca. The purpose of the Fraser Highway One-Way Revitalization Project is to renew the One-Way and create a more welcoming, vibrant downtown for our growing community. The planned replacement of underground utilities has created an opportunity to improve the area and create a more pedestrian-friendly, inviting experience for businesses and visitors. To assist with the design process, the City is working with a team of engineers, landscape architects, traffic planners and community engagement specialists. To date, two rounds of consultation have been completed. Phase One Consultation with residents and businesses sought input on what they most like and most want changed about the Fraser Highway One-Way. Phase Two Consultation in Fall 2018 sought input on design concepts that incorporated key public interests for trees and greenery, vibrant public spaces and improved pedestrian experience for the new One-Way. The City is working to prepare the refined design based on input received during the Phase Two Consultation. The refined design and cost estimate will be presented to Council and shared with the public in early 2019. The City will continue to pursue contribution funding from senior levels of government. The project design is well underway however, there are a number of design refinements being considered that will continue into 2019. The City has deferred the originally planned 2019 implementation of the Project. This means that City-sponsored and third-party events on and near the One-Way in 2019 can continue as planned. Once funding is secured and design is finalized we will begin planning for construction and will develop a communications plan and business liaison program. The City will continue engagement with local businesses and the Downtown Langley Business Association as the Project progresses. Phase One Engagement: Fraser Highway One-Way Phase One Consultation Summary Report, and Appendices. Phase Two Engagement: Fraser Highway One-Way Phase Two Consultation Summary Report, and Appendices. The City of Langley and the Township of Langley are developing a long-term plan for protecting and improving watershed health in the upper Nicomekl River Watershed (east of 196th Street). The City will be undertaking a master plan for Brydon Park, located at the corner of 198 Street and 53 Avenue. It is a community park just north of the Nicomekl River, surrounded by a rapidly densifying residential community. In the City's Parks, Recreation and Culture Master Plan, it was noted that this is a partially developed site and that it should be further developed to increase the recreational and social oppurtunities for nearby residents. Oppurtunities for input throughout the process will be posted on the City website.